A flashing lamp in a Christmas earring is based on an $RC$ discharge of a capacitor through its resistance. 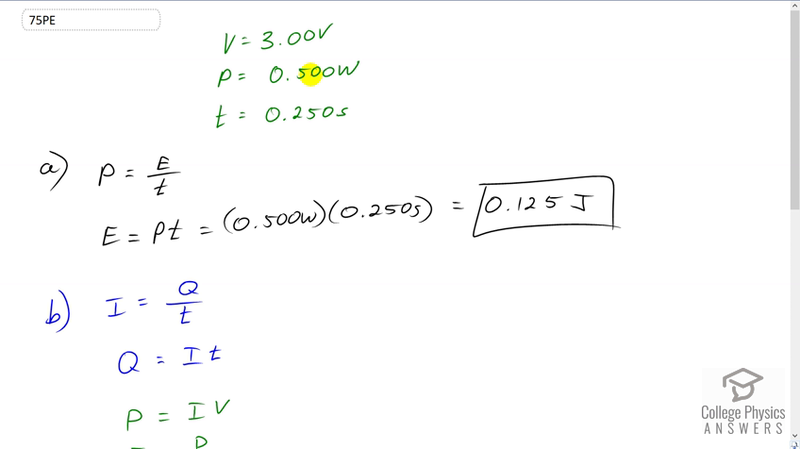 The effective duration of the flash is 0.250 s, during which it produces an average 0.500 W from an average 3.00 V. (a) What energy does it dissipate? (b) How much charge moves through the lamp? (c) Find the capacitance. (d) What is the resistance of the lamp? This is College Physics Answers with Shaun Dychko. Some flashing Christmas lights operated at voltage of about three Volts and dissipate of amount of power of 0.5 Watts in one flash. And the time it take for the flash is a quarter of a second. And so the first question is how much energy is used in a flash? And so we take this power formula, which is energy divided by time and multiply both sides by t. And we get the energy dissipated as the power times time which is 0.5 Watts times 0.25 seconds, giving us 0.125 Joules. Now in part b, we're asked how much charge flows through the circuit on one flash. Now current is charge flow per time, the rate it was charge is flowing. And we can solve this for Q by multiplying both sides by t. And we also power is current multiplied by Voltage. In which case we can solve for I in this equation by dividing both sides by V. And then now we have an expression for I in terms of stuff that we know, power and voltage. And we'll substitute that in for I in our formula for Q. And we've done that here. So Q is P over V times t. And so that's 0.5 Watts over three Volts times quarter of a second giving us 4.17 times ten to the minus two Coulombs. Capacitance is the amount of charge that can be stored in the capacitor divided by the Voltage needed to put the charge. So that's 4.1667 times ten to minus two Coulombs divided by three Volts which is 13.9 milli Farads. And then we're asked for the resistance of this RC Circuit. Now the power is the voltage squared divided by the resistance and we can solve for R multiplying by R over P. And we get resistance as voltage current over power. So that's three Volts squared over 0.5 Watts which is 10.0 Ohms. For part D, 9V/.5W=18ohms, not 10. I believe the answer for D is 18ohms, is this correct?